The role of religion in society and its protection from a “deeply intolerant” militant secularism were themes in Rome and at Lambeth Palace in Great Britain last month. 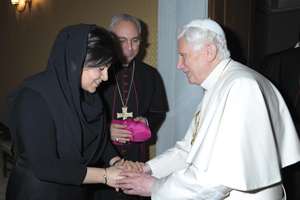 A British delegation to the Vatican on Feb. 14 commemorating the 30th anniversary of the re-establishment of full diplomatic ties between the Holy See and the United Kingdom included the Conservative Party member and senior British government minister Baroness Sayeeda Warsi. Vatican officials and the British ministers discussed plans to work together to fight religious intolerance and discrimination; reaffirmed the need to promote sustainable development that protects human dignity; and recognized the shared commitment to tackle poverty, climate change and arms proliferation. They expressed hopes for a resumption of Palestinian-Israeli negotiations. This article also appeared in print, under the headline "Religious Liberty at Vatican and Lambeth Palace," in the March 5, 2012 issue.